Is Mitt Romney running for the president of the United States or Aquafresh? The R does not respect the typeface at all and looks out of place, the hierarchy is weak (I see “OMNEY” first), and the word “Believe” is too close to the R (it looks like the letter B is leaving a toothpaste trail or something). The kerning is awful, especially between the “EY”. Also, it’s a bit ironic that Romney’s campaign logo features an American flag pointed downward at the ground. After viewing this logo, I’m more inclined to brush my teeth than I am to vote for Romney. 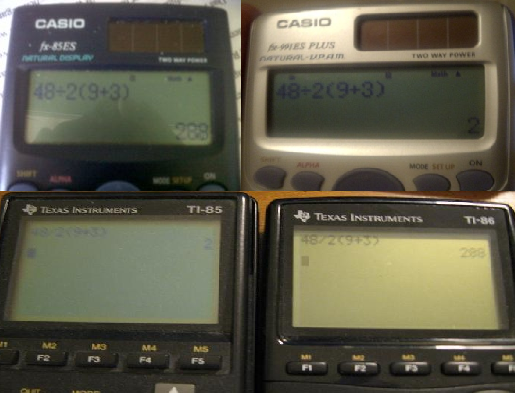 A common technique for remembering the order of operations is the abbreviation “PEMDAS”, which is turned into the phrase “Please Excuse My Dear Aunt Sally”. It stands for “Parentheses, Exponents, Multiplication and Division, and Addition and Subtraction”. This tells you the ranks of the operations: Parentheses outrank exponents, which outrank multiplication and division (but multiplication and division are at the same rank), and these two outrank addition and subtraction (which are together on the bottom rank). This doesn’t equal one, which we all know is how many cups we have. This proves that the side B formula works and the side A formula doesn’t so the answer is “288”, right? Well not so fast. This has the same problem that the previous proofs had. The word problem used (cups) is a scenario where equation B would be needed. But remember, side A reads the equation as A. There are word problems that would fit formula A as well. It is possible to derive a life scenario where equation A would work, but equation B would not. This is yet another case of people solving different problems, which is the reason both sides can create scenarios that prove theirs to be correct and the others to be wrong. Once again, it comes down to what one perceives to be the problem. The first step in problem solving for design or advertising is to state the problem. If one accurately identifies the problem, then said person can accurately create a strong solution. The problem with both sides of this debate is that people were not convinced on what the problem was. People recognized two different problems. This example shows how one can create the wrong solution when said person does not correctly identify the problem. Likewise, in advertising, it is essential that one identifies the problem correctly in order to find the most effective solution. It’s an interesting debate and I can see both sides of the argument. What I think is more interesting, however, is how passionate people have been over such an irrelevant argument. This debate is all over the internet and debates are getting heated. 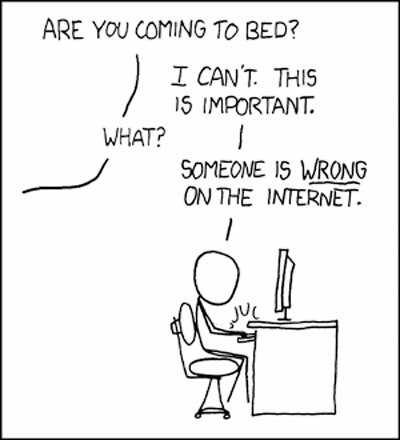 The internet has often become a place for debate. People debate religion, politics, sports, movies, etc. all the time. But with those issues, people are usually emotionally invested in the subject. With this subject, people don’t really have anything emotionally invested in the subject, yet they still have heated debates. People might have something to gain from convincing another to change positions on a political issue, but no one really has anything to gain from winning an argument over a math equation. But, people still engaged in this debate. People will put a lot more time and effort into an argument online than they would with people at home or in the office. The internet has provided an outlet for discussion and debate that didn’t previously exist, or not to this extent. The exciting thing about the advertising industry is that the internet (especially social media) is still relatively new and there are many ideas that have not yet been implemented or attempted. We have seen how engaged people can become in a debate and how debates over something as simple as a math problem can go viral. Wouldn’t it be interesting to start a viral debate over a brand? I’m not talking about debate in a negative way, but perhaps a debate between two good qualities of a product (an example that comes to mind is Miller Lite’s “more taste vs less filling” ads, but I’m sure a better idea could be used). This math equation may have been posed accidentally, but let’s assume a person actually created it with the intention of trolling people. If that’s the case, then said person has not only created an equation that has been posted on many sites (sites the original poster has never even visited) and received thousands of responses on each, but has also created awareness of the brand (the math equation). If a person asked me a math equation, I would normally forget the equation after a few minutes, but since this is everywhere and I’ve read so many arguments over it, I can easily remember “48/2(9+3)”. The equation appears in google searches, on blogs, on message boards, and it is being debated to no end. Imagine if this were the case with a brand! It seems like a campaign focused on starting an online debate over a non-offensive question or statement would be an interesting way to get people to discuss the brand (either directly or indirectly). There are many ways for information to go viral online, but I haven’t seen anyone attempt to advertise a product through viral debate, which is perhaps one of the easiest way to engage people who can’t resist proving the others wrong (as shown in the comic above). I’ve re-designed my website this week and I’d like to take the time not only to promote my new site, but also show older versions and how the design has evolved. 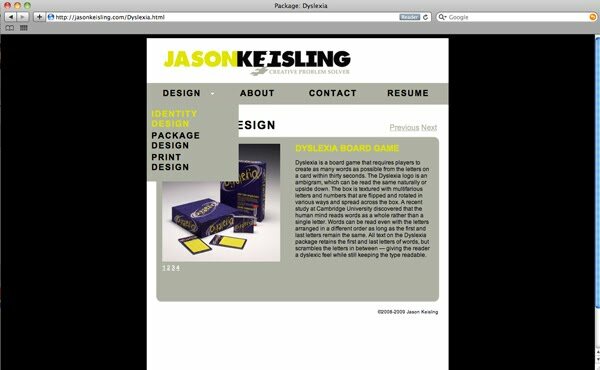 Here is the first version of my website, which I designed in April/May of 2009 while I was in college. As you can see, my logo has since been tweaked and the design is very much limited to my knowledge of dreamweaver/css at the time. 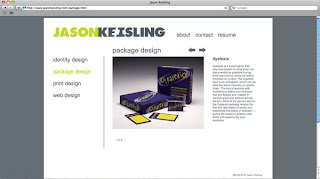 The next website was launched in February of 2010 shortly after graduating. I got rid of the blocky layout and went with a more minimal layout. My most recent design was launched this week, about two years after the initial site was produced. I decided that the previous site was too minimal and many of the elements weren’t connected well. 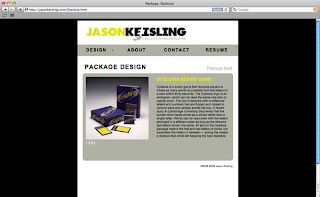 I wanted to design a site that was visually appealing, easy to navigate, and showcased work effectively. I utilized a grid to organize the work in a way that was visually appealing and functional. Rather than having a different page for each project, and numbers and arrows to navigate between different photos of projects, I just simplified the design to one page that features thumbnails of each design that open with a lightbox of the images. I used the lightbox for images so the viewer can view larger images of each project. 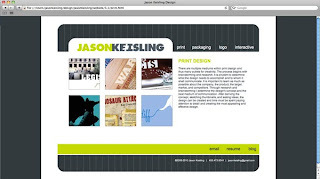 The website can be viewed at www.jasonkeisling.com. 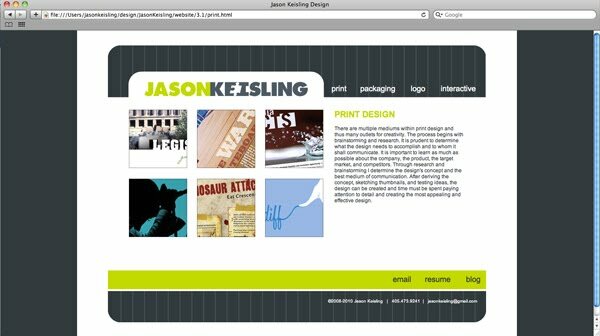 A portfolio is an ongoing process and I will be continually adding more work. I think the site has improved drastically with each layout and I’m hopeful that the eventual fourth version will continue that trend. On the left is the previous Comedy Central Logo. On the right is the new logo introduced in 2011. Which logo looks more like a network that is home to the likes of Jon Stewart and South Park? It’s certainly not the latter. A good logo should be suitable for the company’s product and audience. There is nothing distinctive about this logo, nor does it effectively convey anything about the network. When I see the new logo, I do not think of laughter, I think of a copyright symbol. In fact, when I first saw the new Comedy Central logo on an ad, I thought the ad was for Comcast! Comparisons have also been made to Chanel, which is an upscale fragrance! All of these logos use a “c” in a geometric san serif font and none of them convey humor (which is fine for the others since they do not emphasize comedy). The new logo resembles an internet provider more than it does a network that airs re-runs of Futurama, and that is a joke (I suppose this logo has a punchline afterall).